One of my favorite parts of traveling is the food. I love trying new dishes and the local specialties when I visit a new place. So when one of my friends suggested booking a food tour of Pike Place Market for our recent trip to Seattle, I was totally into the idea. They went a couple years ago and he said that they really enjoyed the tour and that it was a great way to try a few of the popular places in the market. I’ve gone on a few food tours before (Scottsdale, New Orleans, and Venice, Italy) and loved them, so I knew booking one was a must. 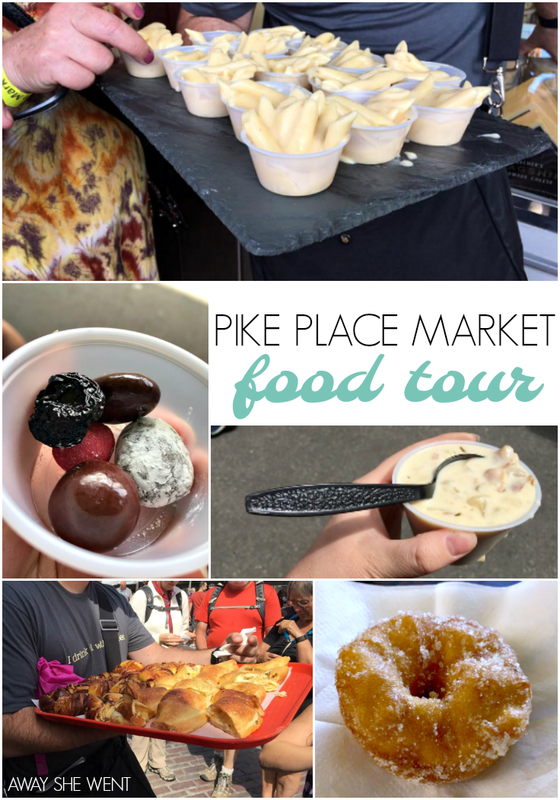 After some research I decided to book Savor Seattle’s Signature Tour of Pike Place Market. There are a few other companies that also do tours of the market, but this one fit our schedule and had most of the samples that I wanted to try. It’s also ranked as the #1 tour of Seattle on Trip Advisor. After taxes and fees it ended up being $100 for the two of us to take the tour. TIP: Sign up for their newsletter to get a coupon code for $2 off per ticket. We ended up picking the 10:30 a.m. morning tour because we figured it would be the best timing for eating the samples as lunch. We got a bit of a late start that morning, so we didn’t have a chance to eat breakfast beforehand. I would definitely recommend eating something small before the tour because we were starving by the time we reached the first stop. The morning of our tour we met our guide Justin near the gum wall (so gross). We met everyone in our group and headed off to our fist sample. Oh, and before we get to the food I have to mention that Justin was great! He was funny, shared some really interesting stories about the market, and was a master at fending off random tourists trying to sneak our samples. OK, let’s start with our first stop: Daily Dozen Donuts. 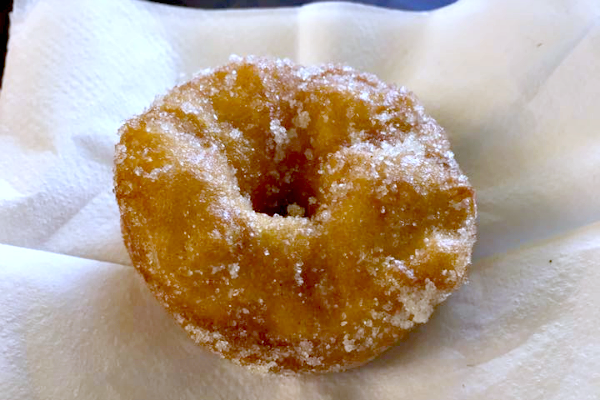 We each got to try a couple of the cinnamon sugar mini donuts. They were hot, fresh and a great way to start the tour. The next stop was Ellenos Real Greek Yogurt. I know Greek yogurt doesn’t sound that exciting, but trust me when I say this isn’t your typical grocery store yogurt. It’s thick, delicious and hands down the best yogurt I’ve ever had. 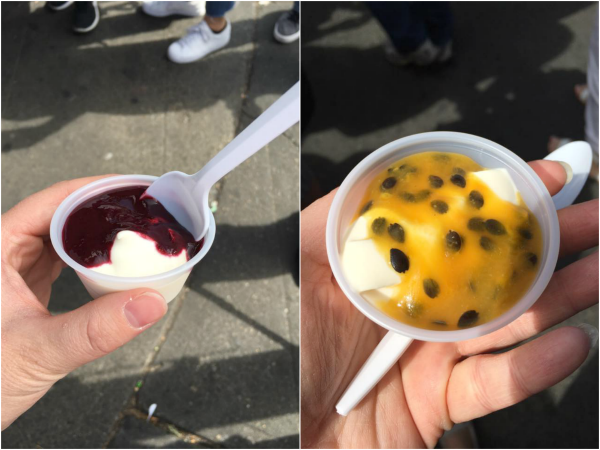 We sampled two flavors and the marionberry was by far my favorite (the passion fruit was a little too sour for my taste). We ended up coming back here a couple days later for breakfast. I got the marionberry again and Adam tried the lemon curd (he really liked it). Next on the tour was Beecher’s Handmade Cheese (you can see the cheese being made through the windows!). To start we tasted the fresh cheese curds. Our next sample was the cheese they make using those curds (Flagship cheese). Finally we tried their mac and cheese (and one of Oprah’s favorite things). The mac and cheese was seriously good and I ended up getting a cup of it at the airport when we flew out. Yes, they have a location in the airport! From there we went to Chukar Cherries. As their name suggests, they are all about cherries. 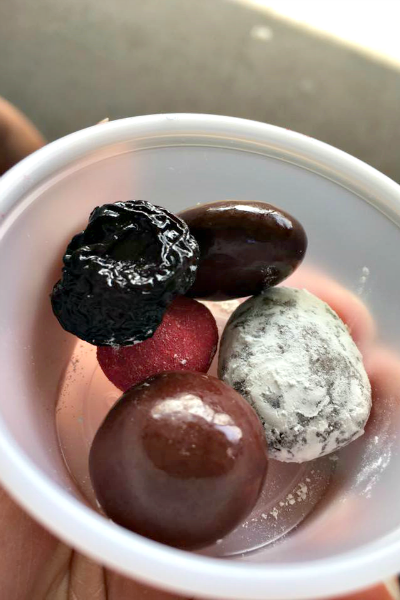 We sampled a couple different dried cherries, chocolate covered cherries, and a chocolate covered honey pecan. After the tour we went back and bought a bag of the chocolate honey pecans and a bag of the black forest cherries. We also got a free gift (chocolate covered cherries) for being on the tour and signing up for their mailing list. The next stop on the tour was Pike Place Chowder. The line for this place was ridiculous so we were really happy to be with the tour and not have to wait in that line (seriously, the line was down the entire alley). We tried the clam chowder (of course) and it was the best clam chowder I’ve ever had. 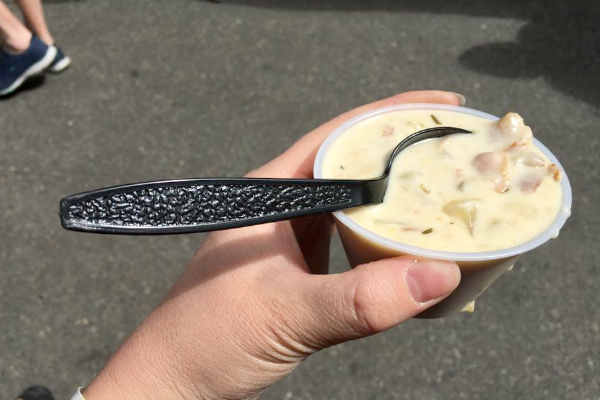 Not surprisingly, they win a lot of awards for best chowder at competitions around the country. They also have a location in the downtown area (with no line), so we went there for dinner the next day. Our second to last stop was Piroshky Piroshky. We tried the potato and cheese and the cinnamon cardamom. If you’ve never had a piroshky, it’s basically a hand held pie with various fillings from Eastern Europe. I wasn’t too impressed with the potato and cheese, but the cinnamon cardamom was delicious. Adam said it was one of his favorite samples of the day. We ended the tour with crab cakes at Etta’s Seafood Restaurant. It’s one of the many Tom Douglas restaurants around the city and the crab cake was definitely high quality. There wasn’t any filler mixed in so you could taste the fresh Dungeness crab. We were only given a sample size crab cake, but our guide said that they are huge if you order the dish at the restaurant. 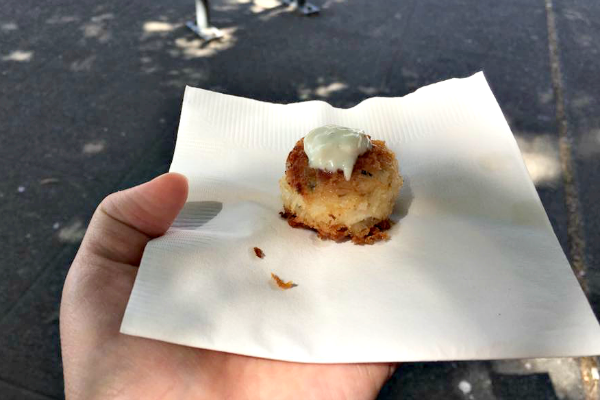 I wish our crab cake had been at least a little bigger, but that’s really my only complaint about the tour. At the end of the tour Justin passed out discount cards and a list of restaurants around the city where they were valid. Most of them offered 10%-off, so it was a nice addition to the tour and they saved us a few bucks on our trip. We forgot to use our card a couple times, but we did take advantage of the Chukar Cherries discount and the free truffles offer at one of the nearby shops. We both really enjoyed the tour and I think that it was a fun way to try some different places around the market that we probably wouldn’t have tried otherwise. It’s also a great way to get familiar with the market because it’s big and crowded, so it can be a little overwhelming at first. The tour lasted about two hours and I suggest leaving yourself another couple hours to go back to any of the places on the tour and explore the rest of the market. 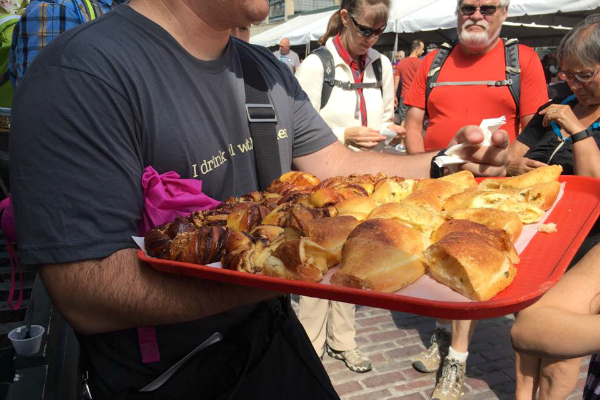 Have you ever gone on a food tour while on vacation? They’re such a fun way to learn about a new place (and try new food). 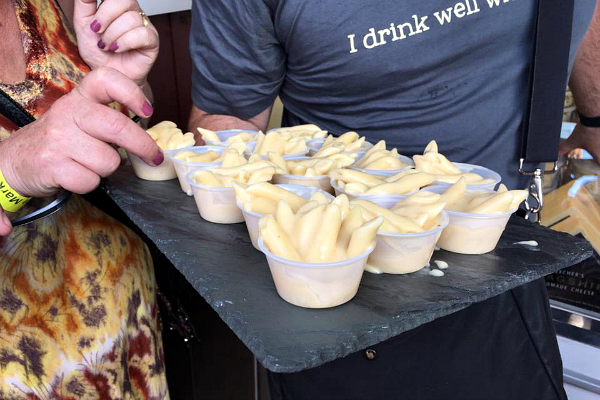 I've never been on a food tour, but it looks like something I would like. Especially those chocolates look delicious. And I wouldn't say no to one of those crab cakes. I love Pike Place! This makes me want to go back! I didn't even know this was an option! 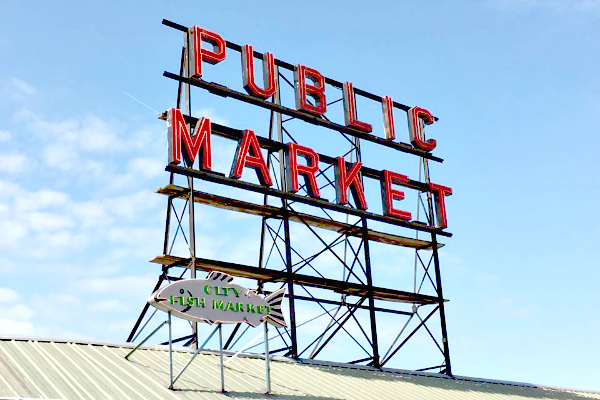 We want to visit Pike Place Market so badly. So awesome to know there is a great option to sample everything. That clam chowder?! It's calling my name!! Omg that looks like heaven! I would never leave...everything looks so yummy! This food tour looks so awesome! I would love to try that chowder and a piroshky. I was at Pikes Place Market and walked around to see it all. I didn't know about the food tour; it looks comprehensive. I would love to go on a Food Tour.. I think my city has one that you can do around the city and go taste samples in the restaurants but not 100% sure, guess I need to check into it a little more so my hubby and I can do it.. Looks like you had some awesome food, especially the cheese. I'm a huge fan of cheese, cheese curds and anything cheese.. lol!!! I've never been on a food tour, but it looks like something I'd really enjoy because whenever I travel, all I do is eat, LOL! I haven't been to Seattle yet, but it's one of the U.S. cities I'm drying to get to. When I do visit, going to Pike Place Market will be high up on my itinerary. 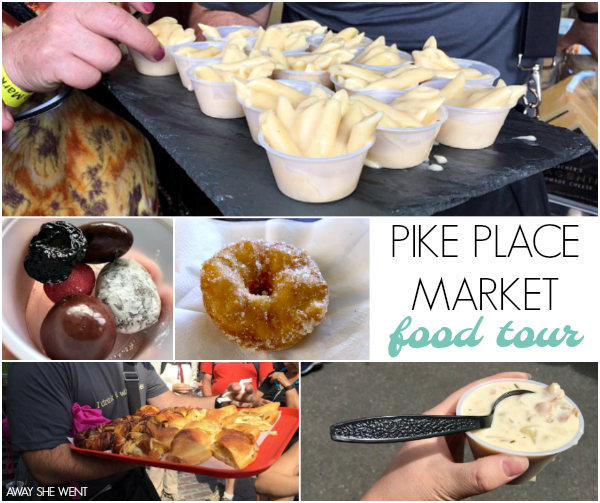 Taking a food tour of the market is a great idea so you can sample a bunch of foods. That mac & cheese looks glorious. I mean, if Oprah approves ... I've got to try it, right? "Drying" to get to. LOL! It's like my brain could decide upon dying or trying and combined them. That was also my second attempt at commenting. I accidentally hit "previous entries" instead of "publish." Can you tell my brain is fried from the weekend? Or "couldn't" decide. I give up on today! This looks like so much fun! And what cool food you got to try! I've never been on a food tour but I definitely want to look into one the next time we travel! I'm loving those little donuts! This food tour looks like a blast. We'll have to check it out if we're ever in the area.